So striking that no one could be blamed for shelling out the $23,000 extra for the M5 First Edition. Just like the peace-promoting free love of the 60’s gave way to the cocaine and consumption-fueled thirst for cash by the 1980s, BMW—along with just about every other automaker—has eschewed the pursuit of “sheer driving pleasure” and gone for what drivers seem to care about most: horsepower. And lots of it too. Our gluttonous ways have left us with a feast of it and not even the EPA could stop the M Division from stuffing the new M5 with over 600 horsepower. The only compromise are those two lag-inclusive turbochargers that cut away at that sense of driving pleasure but bump up top speed and performance numbers on the specs sheet where prospective customers will pay the most attention. That 4.4-liter twin-turbo V8 puts out power on par with the Mercedes-AMG E63 S, and as bad to the bone as that baby may be, BMW has never been an underdog in this segment. 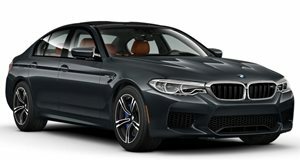 Plenty of evidence of that can be seen in how it strutted into the Frankfurt Motor Show with two gorgeous M5 sedans, one painted in a lovely glimmering shade of San Marino Blue Metallic and our favorite, the First Edition model colored with BMW Individual Frozen Dark Red Metallic paint. So yes, even a machine as impressive as the AMG E63 S may have something to worry about, especially when considering how the new M5 can match its impressive drivetrain with its own M xDrive system that can help this super sedan grip better in the corners or embed its set of rear rubber into the pavement using a drift mode. While the hardware is designed to perform well at the edge of what’s physically capable, it can also tone down the pace and become a luxury grand tourer that cocoons occupants in sumptuous leathery comfort. The only thing the M5 has going against it is the same thing its AMG competitor does: the fact that both Mercedes and BMW are under investigation for colluding to set performance and pricing. The aim of that collusion would be to maximize sales for both automakers as a whole and cut down on the cost of development as well as parts. Given how similar the two cars are, our suspicions have been heightened to say the least. The only way to put these worries to rest is on the race track.